Photograph of a catamaran at Madras, taken by Frederick Fiebig in c.1851. The photograph is one of a series of hand-coloured salt prints. ‘Catamaran’ is a generic term for a shaped raft of bamboo or logs fastened together in various ways. In India, the term refers to a log raft used off the open beaches by Tamil and Telegu fishermen for line and net fishing. They are called 'kattumaram' (or kathu maram), a Tamil word meaning ‘tied logs’. 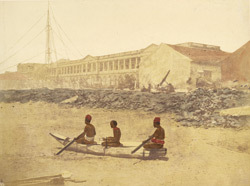 The vessel varies in design but the one shown here is slim with a pointed, upturned bow, and constructed from logs lashed together, on the beach at Madras in front of the customs house and flagpole. At Madras they accompanied the masulah boats which brought passengers from ship to shore through strong surf and were used to rescue any who might be swept overboard. Little seems to be known about Frederick Fiebig. He was probably born in Germany and became a lithographer (and possibly was also a piano teacher) in Calcutta, publishing a number of prints in the 1840s. In the late 1840s Fiebig turned to photography using the calotype process, producing prints that were often hand-coloured. His photographs includes several hundred views of Calcutta in the early 1850s, one of the earliest detailed studies of a city, a large hand coloured collection of which were bought by the East India Company in 1856, their first major acquisition of photographs. Among the roughly 500 pictures were views of Calcutta, Madras, Sri Lanka, Mauritius and Cape Town.